Engage your prospects, clients and partners with real-time marketing integration. Available to our Constant Contact subscribers, sync unlimited records with 1 integration. Sync unlimited Email Marketing Campaigns back to your CRM from any of our supported Marketing Automation solutions. Email Marketing Campaigns are synced back to CRM every 24 hours based on your sync schedule settings. Try our Enterprise plan today! Map unlimited Custom Fields between your software applications connected in SyncApps. Note:Constant Contact subscribers are limited to only the 15 Custom Fields allowed on V2 API of Constant Contact. 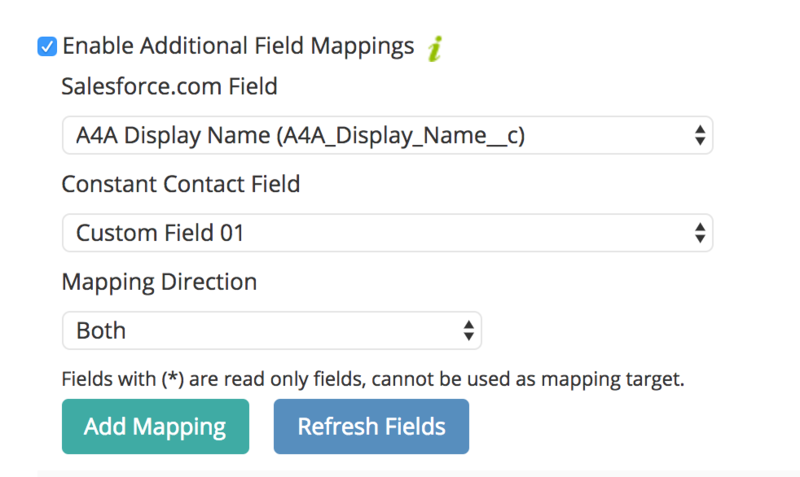 Read more on Custom Field Mapping Feature in our article here. Read more on Filtering and Segmentation Feature in our article here. Sync unlimited Marketing Lists (NetSuite Saved Searches, Salesforce Campaigns or Marketing Lists, Zoho CRM Campaigns, Highrise Tags, Dynamics CRM Marketing List, SugarCRM Target List, etc) from CRM to your Marketing Automation solution. Read more on Full Sync Feature in our article here. 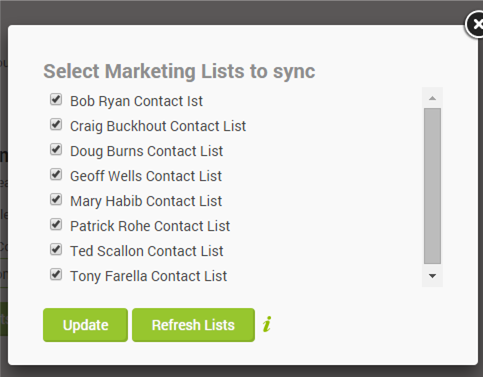 You can set up your Full Sync schedule and Contacts or Leads removal from CRM list(s) or tags will be removed from matched Act-On/Constant Contact/Infusionsoft/MailChimp/VerticalResponse List(s)/Group(s) during a Full Sync. If needing removal from a MailChimp List and not just a Group please get in touch with our 24/7 support@cazoomi.com team to have this enabled on your account today. Lets face it sometimes you need the data now. If you need a tighter sync time (every 6 or 12 hours) then grab this Add-On subscription today. Grab 2 more Sync Profiles to manage your real-time business. Lets face it you sometimes just need to set up more landing pages to feed your SyncApps or different Sync Profile configurations without moving to our Enterprise plans. Need to sync a field other than the standard Email Opt-Out field in your CRM? Grab this Add-On today to expose the Custom Opt-Out field in your Custom Field mapping area to map over your CRM Custom Opt-Out field to your Marketing Automations Unsubscribe field. Incl. : Functionality is included in the plan, no Add-On is needed. N/A: Add-On is not available in the plan. Comes with 20 integrations and unlimited records sync with flexible sync scheduling and 24/7 support. Are you a start-up, non-profit, small business or Enterprise working with a Salesforce expert? After you create an account, your company will get instant access to all Sync Profiles for 2 weeks and we don't require a credit card during the trial, so you get to try Cazoomi risk-free. Our Cazoomi team will email you 7 days into your 2 weeks trial to make sure all is well and again before the trial ends so you can choose one of our three paid subscription plans including, (Basic, Professional or Enterprise) or our Free Plan for Constant Contact customers. You'll purchase the best plan for your business and your current trial account will be upgraded automatically so that all your data mapping is just as you left it, intact. If you need help getting your integration set up we can have our Experts guide you. Constant Contact Salesforce Connector v2.0, deprecated? Another item of concern for us was the campaign responses. In order to view the responses in a contact's profile in Salesforce, all users had to have the Constant Contact App installed on their Salesforce. Is this the same in Cazoomi? All Constant Contact email marketing metrics sync to the Native Salesforce Campaign History object which is available for all users in your Salesforce Organization. Can you tell us what the benefits are of having multiple Sync profiles? We just need a basic sync service - Salesforce to Constant Contact. We don't need Constant Contact to talk to other Apps we install to Salesforce. Sure, since Salesforce has accounts, person accounts, and leads or contacts then each Profile is needed per each object. So if you have leads and contacts in SFDC to sync then you would need 2 Profiles and Sync Profiles allows the added flexibility & room to grow into SyncApps if you have other data to sync. SyncApps is available for Salesforce Professional (API Enabled), Enterprise, Unlimited and Developer Lightning Editions. Supported "Built on Salesforce" software: PatronManager, Apto, and Navatar. Due to restrictions on Salesforce Essentials & Professional Editions, the ability to look-up Salesforce information and post back from applications requires adding API access to your Professional Edition organization. Salesforce Essentials does not use the API and is thus not supported by SyncApps. To enable the API please call, chat or email your Salesforce rep today! Free Plan: 1 integration for Leads, Contacts or Accounts scheduled every 24 hours. If needing more features on your Free Plan we have Add-Ons to meet every requirement for less than the price of a Netflix subscription! Please see our Add-Ons. Create your own integration in just a few minutes. See how to do it in this brief 3 min. video. Once you have created a Sync Profile (don't worry it is simple to do after a quick view of the video above) from your dashboard and are in Step 1 of setup, if have any questions be sure to hover over the little green "i"s, SyncNotes, by the integration points to understand each feature. When selecting "Sync Campaign Response" be sure to check your Salesforce layouts to make sure all fields created by SyncApps are dragged into the layouts for your Salesforce organization before continuing to Step 2. SyncApps will automatically create the fields once you select "Sync Campaign Response" in Step 1 of setup and press "Next" or "Save". If the Contact or Lead already exists in Salesforce then the Event is simply a Campaign on their Salesforce record. If syncing EventSpot please note SyncApps will sync to Salesforce the Registration Date, Registration Status, Payment Status and Guest Count all into to "Email Events" field only if "Use Separate Custom Fields for Event Marketing Fields" is not checked. SyncApps will automatically create the field called "Email Events" so please place this field on the Campaign History Layout. If "Use Separate Custom Fields for Event Marketing Fields" is checked then SyncApps will automatically create each separate field so please place each field on the Campaign Member Layout. 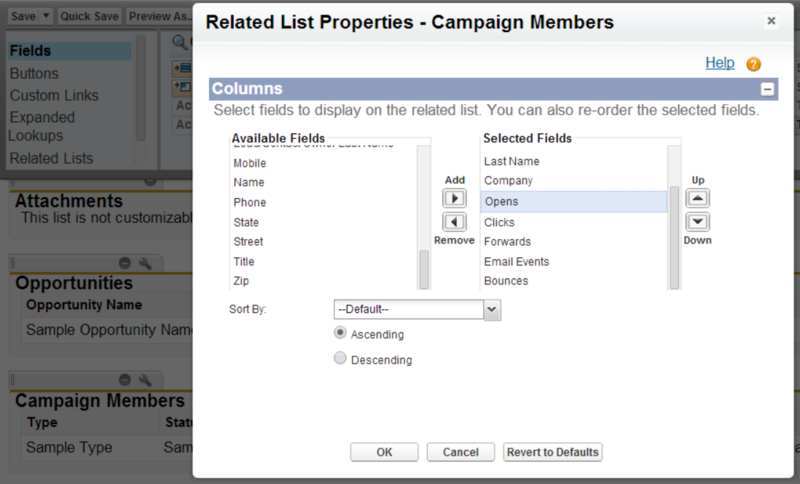 No field mapping is needed in Step 4 unless mapping Order Total to a custom field on the Campaign Member layout. 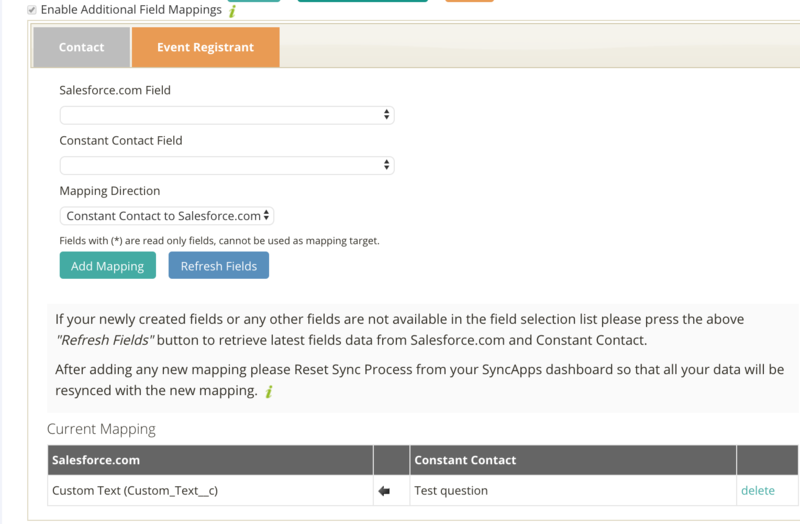 If "Allow mapping Event Registrant details to Campaign Member custom fields" is checked then this means you can map new custom fields to Salesforce you create in Step 4 for the Event created in Constant Contact. The example below is for using Event Marketing with a Constant Contact form to collect answers pre-event in form of a question. After selecting Sync Constant Contact Events in Step 1 then the actual field mapping for the questions on your Constant Contact form can be done in Step 4 of your Sync Profile integration. If needing to migrate Campaign Emails sent, past a rolling 90 days, please contact us today to enable a paid migration Add-On for this requirement. Run again for your team to show how it works! Using Salesforce Person Accounts then please use our Marketing List to search and add to each Marketing List synced to your Email Marketing Platform. Note: Sync on Demand is available in the Free Trial yet Scheduling is available on paid plans. Sync is limited to 100 records per Free Trial. Whether you are in the midst of our 2 Weeks Free Trial or using our paid plans, you can change your Plan at any time by logging into your account to upgrade, cancel or change your plan. If on a paid plan please log in to your Account and click on "My Account" to manage the subscription. If you need to cancel you can resubscribe anytime from your SyncApps Dashboard. SyncApps are billed to your credit card or PayPal on a monthly or yearly basis. You can cancel the subscription at any time and you won't incur further charges, but you are responsible for any charges already incurred before cancellation. SyncApps offers a Free 14-day trial on all SyncApps solutions. Your first charge will come after you sign up on our Paid plans. You will also be notified by email before your Free trial expires to move to a free or paid plan and will be provided the opportunity to cancel at that time after you are on a paid plan. Add-On pricing is here for any SyncApps Plan starting from just $9.99/month/company! Log into your SyncApps Account and head to "Add-Ons" tab in your SyncApps dashboard to select the Add-On options you want today. Whether you are you using our free plan for Constant Contact or our paid plans, Add-Ons can make your integration tasks easier. Let's take a look at the Free Plan as our first example. 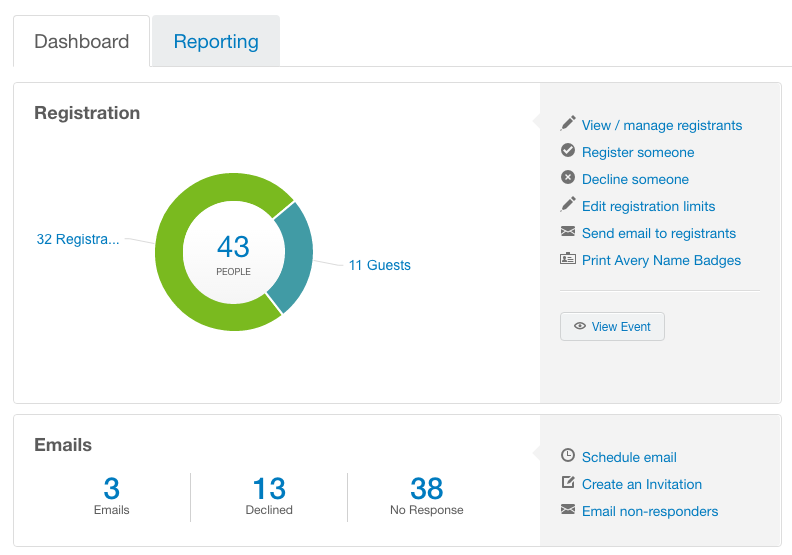 Adding a feature to your free integration plan for Constant Contact like Campaign Response Sync is super simple. Just press the Add-Ons tab and SyncApps will display all your available Add-Ons for your Free or Paid plan with all the details. On the right-hand side of the page, you can select the "Buy Now" button if your requirements call for the feature. On a Free trial, you can try any Add-On or if on a free or paid plan subscribe to any Add-On using the "Buy Now" button located on the Add-On Subscription page. Let's take a look at the Free Trial as our example below as you can trial our Add-Ons too. Bumping into any difficulties while setting up your own Sync Profile with SyncApps? Or thought of these same issues/questions regarding which custom fields specifically in Constant Contact can be mapped in Step 4 of your Sync Profile? Custom Fields created in Constant Contact do not show up in SyncApps Constant Contact Field list even after refreshing fields. I cannot see the Constant Contact custom fields in the additional field mapping while trying to map custom fields in both systems. Even if I press the refresh fields button the newly created fields do not show up. The Fields are being displayed with Standard Naming in Cazoomi (custom_field_1 -- custom_field_15) but not with the name we created in Constant Contact. How do I import Custom Fields from the signup form, back to the Contact/Account/Lead/Targets? I had a Custom Date Field called "Subscribed Date" in Constant Contact but I don't see that Custom Date field in the Cazoomi Field Mapping Section to map it to Salesforce. Well, these don’t sound so hard to answer however it's a bit more complicated. Just to let you know that adding a custom field in Constant Contact does not give any added functionality to the 15 Available Custom Fields allowed in the current API for Constant Contact. In Constant Contact, only 15 Custom fields are allowed. 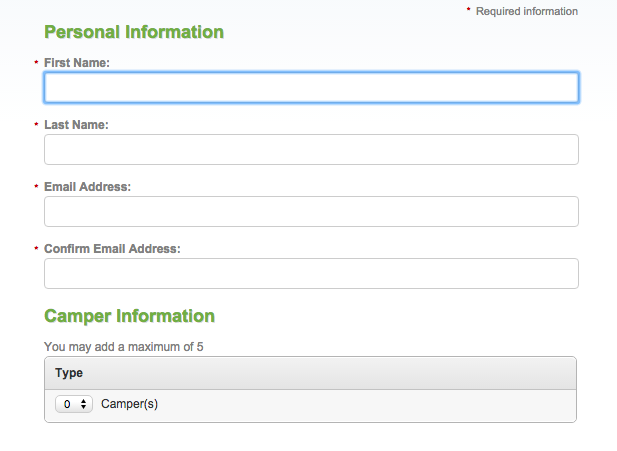 Beyond these 15 custom fields, Constant Contact’s API will not support extra fields. However, you can map the 15 fields to match your fields in CRM. Add a new Custom Field and name it Custom Field 2 and so on. 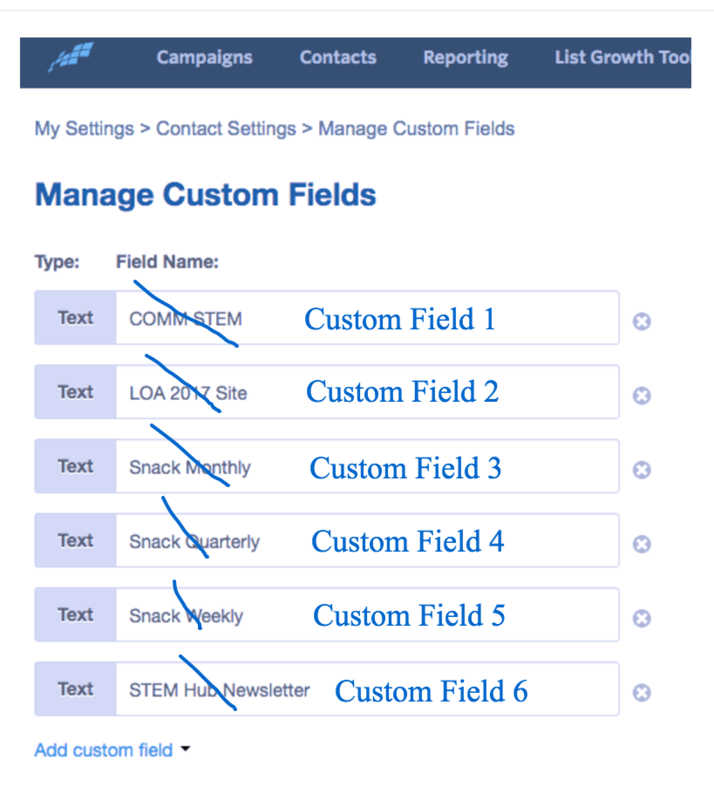 Just be sure to jot each field label (COMM STEM = Custom Field 1) down to be used in your Sync Profile to map the 1-15 custom fields available to your CRM field(s). You will need them as Constant Contact only supports the naming of custom fields 1-15 as shown above. Let us know if you hit any snags through emailing us at support@cazoomi.com. Have I set up my Constant Contact for Salesforce correctly? Customer: I am having trouble seeing the emails sent and the email marketing campaign metrics from Constant Contact in Salesforce. Any guidance would be appreciated. Cazoomi: Can you have a look at the setup video needed to view these in your Salesforce account below and review our guide below too? Customer: I think my problem is that the custom fields (number of opens, clicks etc.) are not showing up as options to add in the layout in Salesforce. 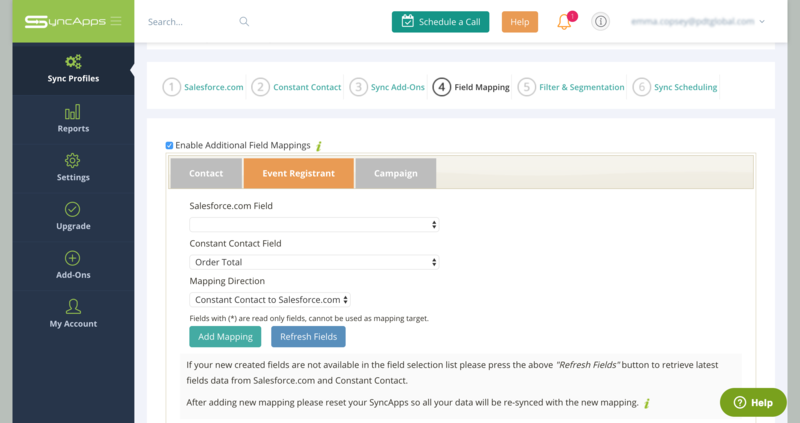 Do I need to add custom field mapping in SyncApps in order for them to show up as options in Salesforce? 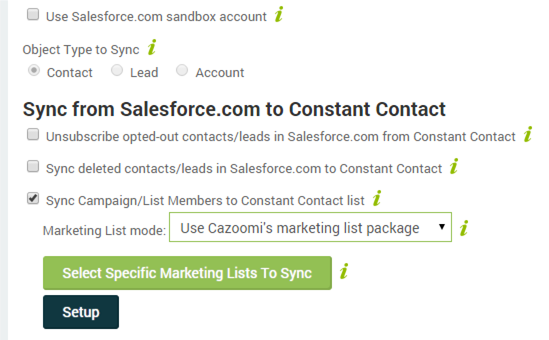 Cazoomi: If sync campaign response is enabled the *SyncApps will create custom fields in Salesforce.com CampaignMembers* (Campaign History) object to store email marketing metrics such as the number of opens, clicks, etc. By default, the custom fields will not be displayed in any layout. To make them visible, you will need to update current layout and add the custom fields into the layout like in the above screenshot. This should not be the case as once you add them to your layout they will pull in the metrics. Customer: I don't know if screenshots would be helpful in this case, but when I go into Marketing=>Campaigns/Leads/Contacts=>Create new view or edit view, my campaign created in Constant Contact is not present and there aren't any fields for "open, clicks, bounces, forwards". By default, the custom fields will not be displayed in any layout. To make them visible, you will need to update the current layout and add the custom fields to the layout like in the following screenshot. Customer: I am still unable to select a specific campaign in SyncApps to sync. I also don't think the contacts I added in Constant Contact were synced to Salesforce, as the sync summary says no records were synced and I also don't see them in SalesForce (screenshot attached). There was an additional error message regarding sync campaigns. I did signup for the Professional version of SyncApps hoping to bypass the limited 100 contact only syncing capability with the trial version. Perhaps if we close down this account and start all over again, we might be able to get around the errors that are occurring? If you have time I would really appreciate if you could call me. Cazoomi: Thanks and no need to close the account to start over. Should be a quick turnaround on this so I have escalated this to our team today based on this issue. Our team lead will be looking into the issue tonight. Customer: Just went into SyncApps this morning and still unable to select campaigns. I also hit sync and again no records were transferred etc (see screenshot). Just wondering about any progress on your end. Cazoomi: I have a case escalated now with SyncApps team so they are still investigating this still. I think this is a permission issue. Could you please confirm if you have full access to campaigns object? Customer: I am working on the administrator's username in Salesforce. If you give me instructions on how to confirm that I have full access to campaign objects, I can check. Please feel free to call me if you think that might be easier. Cazoomi: We can have our Salesforce team lead help you since this is a Salesforce.com related issue, not SyncApps. Customer: It seems the sync went fine since 12th May. So there should be no permission issue here. Campaigns selection also works. Cazoomi: Could you please try to re-sync again. To see the metrics for Constant Contact, you will need to put the custom fields on the layout. Customer: Sorry to bother you again. 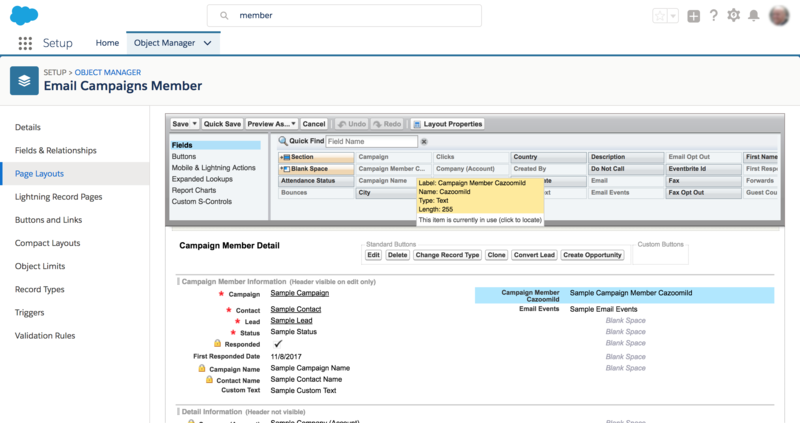 My campaigns did sync to Salesforce! But unfortunately, it is showing that none of the emails were sent (0 numbers sent) and I'm not seeing the fields we inputted (clicks, bounces, forwards etc) or campaign members involved in the campaign email sent. Any help would be appreciated. Thanks! Cazoomi: Currently we don't update the number of sent so [total contacts + total leads] is the number of sent. To see the click, bounce, forwards you will need to add the fields to the layout. You will need your Salesforce admin to do it or our teams can assist you. Please note that the way SyncApps work currently is "Only syncs metrics for email addresses that have been synced by SyncApps previously". In the log I see only 60 emails have been synced, so only metrics for those 60 email addresses will be synced. To solve this problem you can do initial sync, sync all contacts to Constant Contact by unchecking "Sync Campaign Members to Constant Contact List" then do a sync. After the sync completed you can check the option again. Could you also please send us a screenshot when you click "View All Campaign Members" link in your last screenshot. Customer: I did not see that option before. When I click on it, it does show me who I sent the emails to. However, Still having a problem with integration. I moved all contacts in Constant Contact into the "Master List" (as Clint instructed) that initially had 60 contacts, but with the additions of contacts added from other campaigns now comes to 490. When I reset sync setting and attempted to sync, still only 25 contacts from CC to Salesforce were updated and only 60 Salesforce to CC were updated (screenshot attached). So when I go to Campaigns in Salesforce and look at Design Invite Campaign only 12 Campaign Members exist when I sent the email to 90 people. I did notice that the "Contact List" in Constant Contact only had 12 contacts, so perhaps it is pulling from lists and not email campaigns. Perhaps someone can give me a call and take some time to walk me through this until the problem is fixed because I can't seem to figure it out. Thanks! Cazoomi: I have few questions. Your configured Constant Contact master list is "HD Invite List". Did you moved all the contacts to "HD Invite List"? From SF to CC you configured to sync only contact in the following campaign: Designer Invite, Date Corrected Supplier Invite, "Supplier" HD Expo Invite. How many contacts are in those 3 campaigns? Yes, I have all 490 contacts in "HD Invite List" in CC. However, my "HD Designer Invite List" (email associated with this list called "Designer Invite" and has 371 contacts) and "HD Expo List" (email associated with this list called "Copy of Copy of Test Final MindClick Team" and sent out to 138 contacts) in Constant Contact are the ones that I sent the emails out to. However, I do not see these "campaigns" in Syncapps as options to choose to sync. I just refreshed my campaigns and Date Corrected Reminder of Designer Invite came up and I selected it. It did sync to Sales Force but there are only 60 Members in it when it went out to 2 CC lists: Reminder Designer List (366 contacts) and Reminder Supplier List (135 contacts). It can't seem to get beyond the original 60 contacts it synced from Sales Force. Is it possible to delete my account and I can start this process over again bringing in the correct number of contacts from Sales Force? "It can't seem to get beyond the original 60 contacts it synced from Sales Force. Is it possible to delete my account and I can start this process over again bringing in the correct number of contacts from Sales Force?" You can always create another Sync Profile in your SyncApps account and delete the old one as it takes about 3-5 minutes to set up. Customer: I created a new sync profile, but no records were transferred. I am reviewing your Operating Guide and have this down. Create a campaign in Sales Force with all of the contacts that I want to send an email to in Constant Contact included. CSync specific Sales Force campaign by selecting it in SyncApps. Find the specific campaign "list" in Constant Contact. Create and send email for that "list". Sync that campaign again in SyncApps. 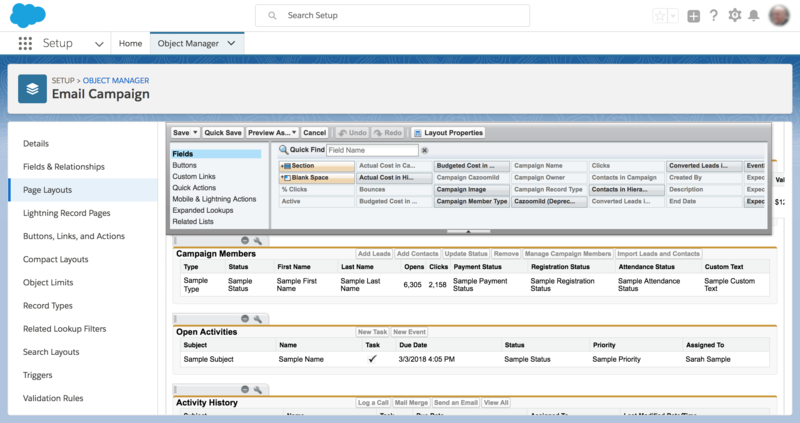 FThe campaign metrics will then appear for that campaign on Salesforce side. Cazoomi: Yes. Using the above process will make sure campaign metrics appear on Salesforce. Customer: I left a message earlier this morning. I went through the process I outlined in my prior email and metrics are not appearing in my test campaign in Salesforce. I need to send another campaign out on Thursday and need to have this functioning. Please call me to troubleshoot. You sent a CC campaign "Reminder HD Email with corrected Date" to emails in "Test 2"
SyncApps created a campaign with name "Reminder HD Email with corrected Date", updating the metrics from Constant Contact. Because many CC campaigns can be sent for one CC list we decide to hide the campaigns created by SyncApps to make it clear between "Campaign as List" and "The real Campaign sent in CC". How can I sync Person Accounts from Salesforce to Constant Contact? I thought by using the marketing list functionality, it would allow the sync of Person Accounts. In your Sync Profile you just need to click edit, then click next to get to Step 1 and use the "Marketing List" feature instead of Campaigns as you have selected currently. 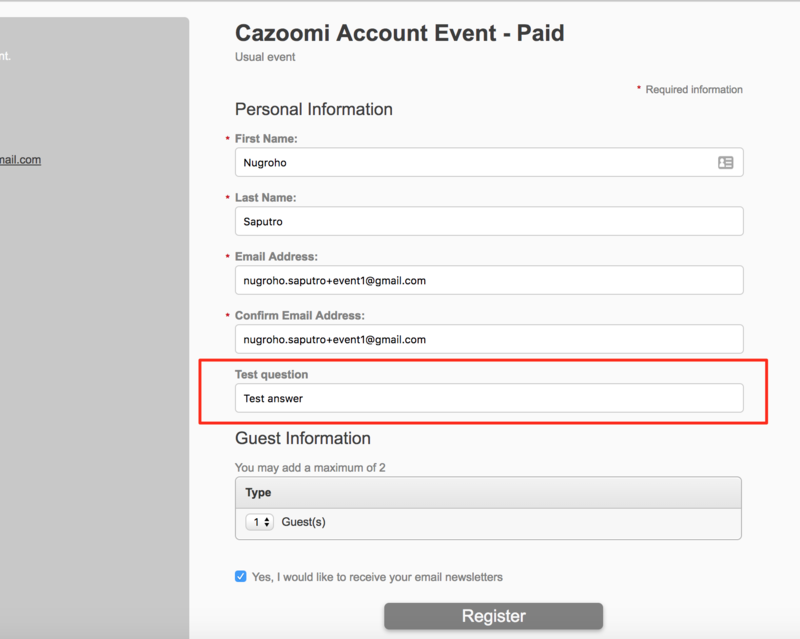 Select "Use Cazoomi's Marketing List package" in the drop-down menu. Also, select Object Type to Sync: Contacts as Person Accounts are used in your Salesforce this way. Thank you for the response, however, your suggestions are not in line with the options I have available. See below screenshots. I also have installed the Marketing List package. Also when selecting the object, I do not have Person Accounts available. Since your Non-Profit Salesforce version uses Person Accounts as Contacts this would be the Object Type to Sync in your Sync Profile. In a Marketing List, you can filter to get the Person Accounts (Contacts) you need and add some or all of them to each list. Following your screenshot above if "Bob Ryan Contact List" is filled with Person Account then each would be synced to the Constant Contact List. Sync multiple Constant Contact accounts to one Salesforce account? We have one dept who will be using EventSpot and another who will be using Email Marketing. We are looking into setting up separate constant contact accounts for them. Will this work ok with SyncApps? Yes, please setup 2-4 separate Sync Profiles for Contacts and/or Leads using 1 Salesforce login for your credentials in each Sync Profile(s) for each different Constant Contact credentials in setup of the Sync Profile(s). If we change account owner (or any specified field) for a Contact in Salesforce, will the sync catch the Salesforce account owner change and also change that field in Constant Contact during the sync?